Our purpose is to serve the GRCC community as an outreach of the Presbyterian Churches in Grand Rapids. We hope to establish connections with students by being familiar faces at the same time and place every week. Our table will be located on the first floor of the Student Center We will be there every Tuesday that classes are in session beginning from 11:00 AM to 2:00 PM. A team of three serving on the first shift from 11:00-12:30 gets the supplies from Student Life (sign, bookmarks, and goodies for students.) The second shift serves from 12:30- 2:00 and returns all supplies to the Student Life Office. A notebook will be available to make notes about conversations you have with students, so if a person returns, you or another listener can have some idea of previous conversations. We as listeners must look approachable, friendly, un-busy, with plenty of time to listen and talk. That means put your phone away! We all know someone we consider a good listener and they listen thoughtfully, ask questions to clarify or make us think, and make appropriate observations. We are listeners, not professional counselors. We will schedule additional orientation and training as needed as new volunteers join us. 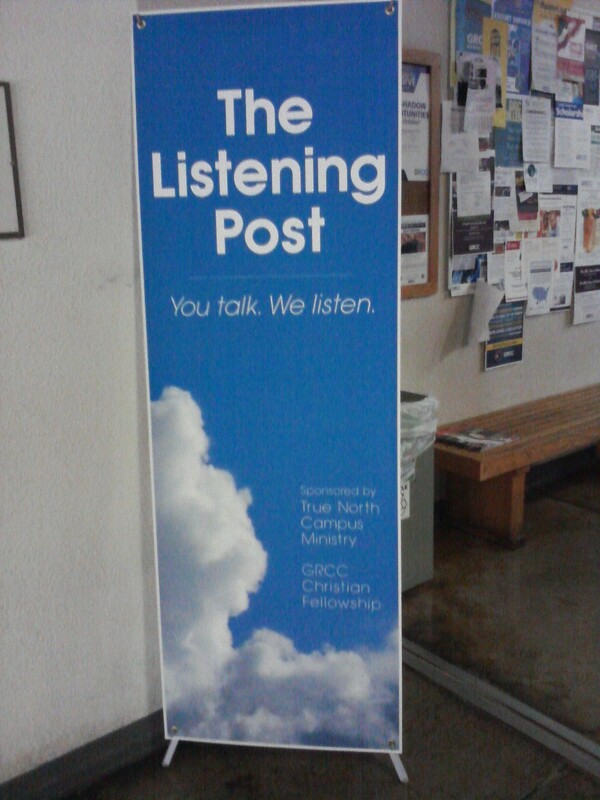 * The Listening Post Welcome: At the Listening Post, precisely because this is a Christian project, absolutely everyone is welcome. We do not assume or presume you to be Christian. Our hope is that we might be Christian toward you and welcome you into the heart of God, as we ourselves have felt welcomed.